Students place their hands under a blue light to reveal germs on their hands during a session on 'All About Germs'. In addition to the fun, hands-on experiences that allow attendees the opportunity to understand the complexity of public health, the Public Health Summer Camp is intended to showcase public health as a viable career option, and create a well-informed and diverse health care workforce for the future. The School of Public Health and Health Professions (SPHHP) strives to expose youth in our communities to possibiliites for careers in public health and health professions. 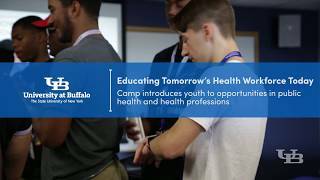 To that end, SPHHP has partnered with the Erie Niagara Area Health Education Center (ENAHEC) to host this week-long summer camp. ENAHEC is a federally and state-funded initiative with a focus on increasing diversity by recruiting and training people of all races and ethnicities for careers in health care.